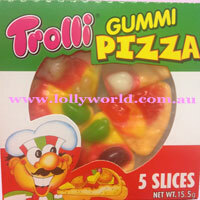 Trolli Gummi Pizza are great for kids birthday lolly bag fillers. 5 pieces of gummy pizza to snack on yourself or treat the kids. Buy them in a pack of 5 or a bulk box of 48. Trolli Gummi Pizza are great for kids birthday lolly bag fillers. Snack on yourself or treat the kids. Buy them in a 5 pack or a bulk box of 48.